Indio (September 30, 2016) – NABA Lightweight champion Petr “Zar”Petrov (37-4-2, 18 KO’s) of Ryazan, Russia weighed in at 134 lbs while WBA Number 3 rated Lightweight contender, Michael “The Artist” Perez (24-1-2, 11 KOs) of Newark, N.J. weighed 135 lbs WBA Lightweight World Title Eliminator on September 30 at Fantasy Springs Resort Casino and broadcast live nationally on Estrella TV’s Boxeo Estelar. Petr Petrov vs. Michael Perez is a 12-round fight for the WBA Lightweight World Title Eliminator presented by Golden Boy Promotions in association with Banner Promotions and sponsored by “Cerveza Tecate, BORN BOLD.” The Boxeo Estelar broadcast will air live on Estrella TV at 10:00 p.m. ET/7:00 p.m. PT. The card will also stream live on EstrellaTV.com and on YouTube via LBI Media, Inc.’s Fenomeno Studios. 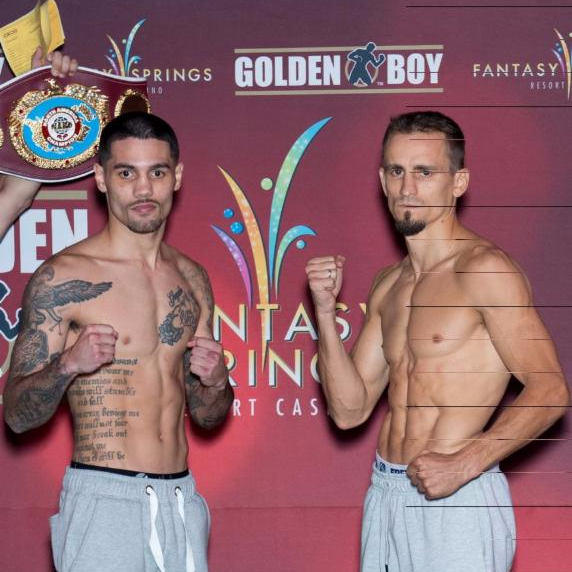 The Ring TV live stream will begin at approximately 5:30 p.m. PT through 7:00 p.m.
Tickets are still available for purchase at the Fantasy Springs Box Office, by calling (800) 827-2946 or online at www.fantasyspringsresort.com. All floor seats are now sold out. For more information visit www.goldenboypromotions.com, www.estrellatv.com, follow on twitter at @GoldenBoyBoxing, @EstrellaTV, and become a fan on Facebook at www.facebook.com/GoldenBoyBoxing, http://www.facebook.com/EstrellaTVNetwork, visit us on Instagram at @GoldenBoyBoxing and @EstrellaTV; and follow the conversation using #BoxeoEstelar.